The City of Peterborough is taking action to determine the extent and impacts of hazardous waste deposited within the boundaries of Harper Park due to operation of a legacy landfill operated from the mid-1940s to the mid-1960s. Dillon Consulting Ltd. has been awarded the contract to complete the initial Environmental Site Investigation, determine long term remedial action options and to implement short term remedial strategies on lands identified as the legacy Waste Disposal Site. Dillon Consulting Ltd. will be holding a series of public consultation sessions, the first of which will be held on Thursday, June 7th. Time: 6:00 P. M. to 8:00 P. M.
The HPSI is an identified stakeholder within this process, and as such, we will be sharing our information on the Harper Creek Woodland and Wetland Complex with Dillon Consulting Ltd.
At a stakeholders meeting, also scheduled for June 7th, the HPSI will be provided with an opportunity to ask questions, and voice concerns, regarding any potential impacts that remediation of the waste site may have on the park. This is a great chance to work in partnership toward solutions that will mitigate disturbance to the natural environment of this locally significant wetland and natural heritage site. We would like to bring a variety of community perspectives and ideas to the table, particularly with respect to future land use planning as it relates to Harper Park and adjacent properties. To represent the community we need to hear from you! If you have any questions, comments, or concerns regarding the impact of this study on Harper Park, short or long-term, please send us an email (just click on ‘Contact Us’ in the menu bar) so that we can ensure your concerns are addressed. 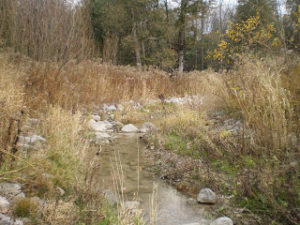 The main channel of Harper Creek as it enters Harper Park from Bridlewood Park.